In many divorce cases, the separating couple anticipates and appreciates the benefits of reaching a mutually agreeable marital settlement agreement (“MSA” or “Agreement”). The terms of the agreement will vary depending on the circumstances, but most often they will cover issues such as the division of community property, child and/or spousal support, child custody, and other relevant matters. Essentially, the MSA is a contract and is treated as such by the family court. In order to ensure that the Agreement contains provisions that will protect your financial rights at the conclusion of your marriage, and also hold up in court, you are encouraged to contact an experienced family law attorney as early as possible in the process. In a recent California case, Madrid v. Kolbisen, et al., the parties were divorced in 2011. Their marital settlement agreement contained a provision indicating that each party would continue to retain a half-interest in their family business after the divorce. The MSA also granted the family court “continuing jurisdiction” to monitor the management of property jointly owned by the parties, as well as to “divide or order the sale” of the property. Under California law generally, in a proceeding for a dissolution of marriage, the court has jurisdiction to inquire into and render any judgment and make orders concerning many issues, such as the settlement of the property rights of the parties. The ex-husband asked the family court to determine the value of his ex-wife’s share of the business and to order the forced sale of her interest to him. While at the time of the divorce, the ex-husband stated that he was hopeful the couple could continue to work together, he alleged that now there were too many conflicts impeding the running of the business. The ex-husband argued that the family court had jurisdiction under the terms of the MSA, as described above. Shortly thereafter, the ex-wife filed a civil action seeking damages for breach of contract and a declaratory judgment that the sale of any interests in the family business should be governed by the shareholder agreement, not the MSA. The ex-husband filed a motion to strike the ex-wife’s complaint, arguing that the family court had already started proceedings on the same issue under the MSA. The trial court agreed, ruling that under the doctrine of “exclusive concurrent jurisdiction,” the family court had exclusive jurisdiction to enforce the MSA. The ex-wife appealed, citing the trial court’s error in rendering the decision. She further claimed that the shareholder agreement precluded the relief sought by her ex-husband. The court of appeals reviewed the grounds for jurisdiction and concluded that the doctrine of exclusive jurisdiction did not apply to this case because the first request and the subsequent civil complaint were both filed within the same county superior court. However, the court ruled that the doctrine of “priority of jurisdiction” did apply, rendering the trial court without power to grant the declaratory and injunctive relief sought by the ex-wife. The court concluded that the family court had jurisdiction to hear the ex-husband’s request under the MSA. Specifically, under the clear and plain language of the Agreement, the family court was granted continuing jurisdiction to hear disputes arising from the parties’ management of jointly owned former marital assets. Furthermore, the court pointed out that the MSA was entered into after the shareholder agreement, and therefore it would be deemed to have amended the shareholder agreement to the extent that there was any inconsistency between the two documents. While this is an unpublished opinion, the underlying legal principles could still serve to inform future divorce cases in California courts. The outcome exemplifies the strong need to prepare a solid marital settlement agreement — one that complies with current law and adequately protects your interests. 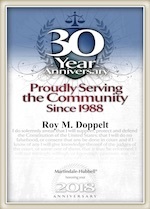 Roy M. Doppelt has been representing parties in divorce matters for more than 20 years. His office serves clients throughout Southern California, including in San Diego, Encinitas, La Jolla, and Chula Vista. For a free consultation, contact Doppelt and Forney, APLC through our website, or give us a call toll-free at (800) ROY IS IT (769-4748).